Apply as an International Student in Canada. Immigration, Refugees and Citizenship Canada (IRCC) is making improvements to the way it is promoting Canada to make it the destination of choice for International Students who are looking for a first-world educational experience. In a news release, IRCC said that it is finding more efficient ways to process applications made by International Students. 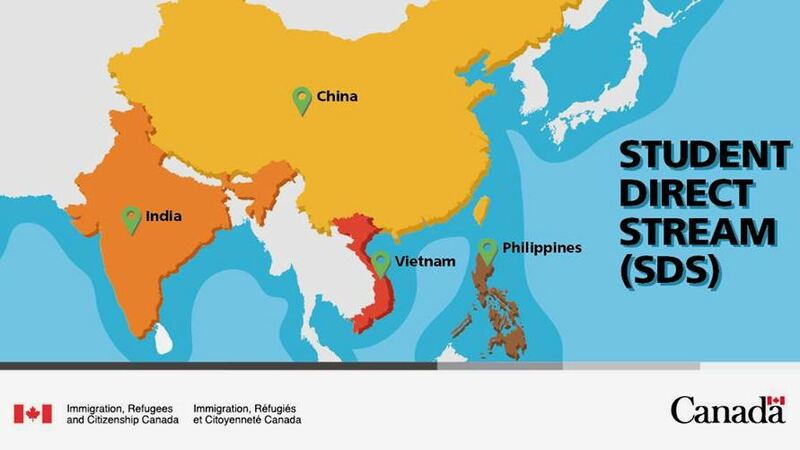 IRCC announced the new Student Direct Stream (SDS), which is available to students from different countries such as China, India, Vietnam and the Philippines. Applicants must demonstrate that they have the funds and language skills to successfully complete the program to be eligible to apply under the SDS. The SDS replaces different Study Permit programs already in place in these four countries. IRCC is also looking to expand the SDS to Africa, and are exploring pilot programs in Kenya and Senegal. Applicants for the SDS must be accepted at a designated Canadian Learning Institution (CLI) that is allowed to host International Students. They must also be able to prove that they are able to pay for the total amount of tuition for at least the first year. They must also be able to provide proof of purchase for a Guaranteed Investment Certificate (GIC) of $10,000. They must also be medically admissible to Canada. Applicants must have either graduated from a Canadian-curriculum high school or have a qualifying score of at least 6 for IELTS or 7 for TEF. The SDS has higher language proficiency requirements than the regular Study Permit applications. If applicants do not meet the minimum requirements of the SDS, they can apply for a Study Permit under the regular process. The SDS complements the Express Entry System, with International Students under the SDS allowed to apply for Permanent Residency. IRCC has expressed their commitment in improving the International Student Program by making the process of applying faster, easier and more accessible. The SDS will be evaluated again in 2019.